Petunias do not need to be lonely and relegated to the onion patch. Petunias are generally a very forgiving species of half-hardy annuals that are easy to grow from seed. Some special varieties may be easier to grow from plug plants or cuttings although it is not worth the effort of over wintering the plants. Petunias generally have masses of vibrant coloured flowers throughout summer. Plants grow 6-12″ high or trail in the case of Surfina varieties. A wide range of colours are available as demonstrated in these photos. Grandiflora flowers can be large, showy and 4″ across or Million Bells varieties have masses of 1″ flowers. 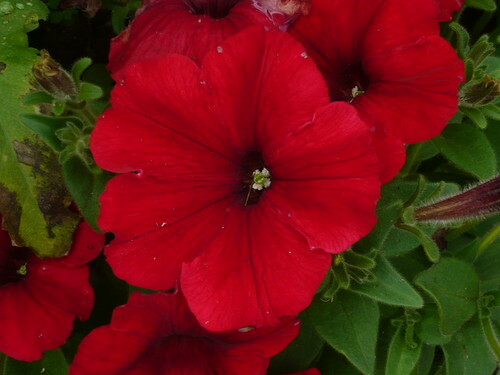 Petunias spread during summer and do well if watered and fed. 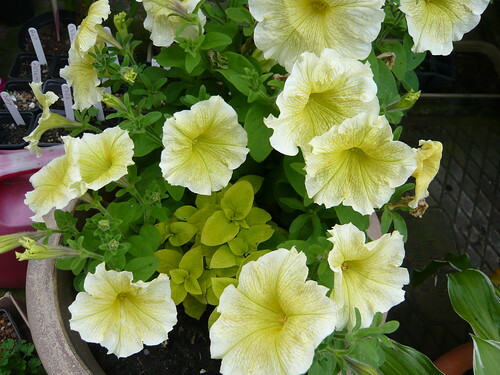 Use Petunias in containers, borders or hanging baskets. Seed is very fine and hard to collect for next year. Sow seed in late winter – mid spring at 21-27C on the surface of a good seed compost. Do not exclude light, keep compost damp but not wet and seal in a polythene bag after sowing. Germination usually takes 10-21 days. Broken stems can be encouraged to root to produce more plants. The secret of good petunias is plenty of strong light. Petunia ‘Citrus Spritzer’ is a Mini Petunia also called Calibrachoa. Withmasses of flower power producing in excess of 500 blooms per basket, mini Petunia ‘Citrus Spritzer Mixed’ are simply made for hanging baskets. Free flowering and easy to grow, these astonishing calibrachoas make a spectacular summer display. Height and spread is 30cm (12”). Surfinia’ petunias are still the most loved and reliable petunias, producing hundreds of beautifully coloured, trumpet shaped flowers. Support Petunia ‘Surfinia’ on a climbing frame and it will rapidly climb up to 2m/6ft high to create a non-stop tower of colour. These petunia flower from June right through to the first frosts of winter. Petunia ‘Waves Mixed’ F1 were a version of the earliest petunias. 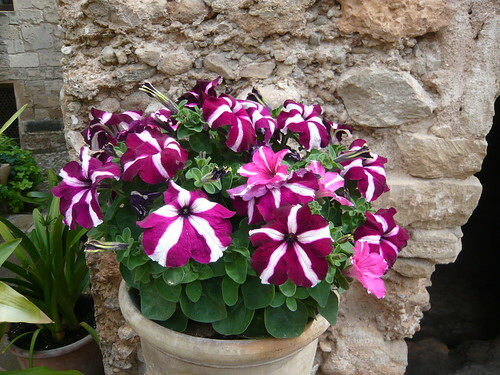 The ‘most weather resistant’ is claimed to be Petunia miniflora ‘Mini Bella Picotee Mixed with the appearance of stripped flowers. 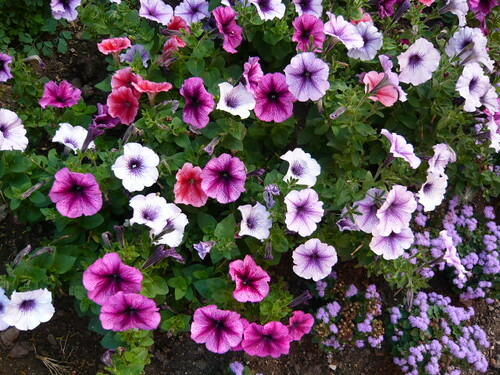 Spreading petunias are only about six inches tall, but spread so rapidly that they cover a huge area in one growing season provided they’re watered and fertilized frequently. South American origin Petunias are from the family Solanaceae that includes tobacco, cape gooseberries, tomatoes, deadly nightshades, potatoes and chili peppers.